Discontinued in Dec. 2008. If you are looking for the below items, they are long gone. But we do have a solution for some. Read on past these 12 small old Lenape images. Lenape model 200 soap dish. Was 6x6 fully recessed. Lenape model 231 fully recessed soap dish with drain spout. Was 6x6. Lenape model 271 tiny recessed soap dish. Was 4x4 outside dimension. Lenape model 276 double wide recessed soap dish. Was approx. 4x8. Lenape model 296 soap dish, fully recessed. Was approx. 4x6. Lenape model 490 semi-recessed towel bar. Lenape model 626 semi-recessed TP holder. Lenape model 696 semi -recessed soap dish with washcloth holder. Lenape model 697 semi-recessed soap dish. Lenape model 798 square semi-recessed soap dish. Lenape model 1705 recessed shower caddy. AC Products produces the following items in approx. 100+ colors. The ACP-BR794 fully recessed soap dish is a replacement for the Lenape 200. The ACP-BR796 fully recessed TP holder is a replacement for the Lenape 225. The ACP-BR797 fully recessed shower caddy replaces the Lenape 1705. The ACP-BM777 mud set TP holder is a good substitute for the Lenape 626. The ACP-BM725 mud set soap dish is a great replacement for the Lenape 697. The ACP-BM730 mud set towel bar is a replacement for the Lenape 490. The ACP-BM782 mud set tumbler holder is a "fair" replacement for the Lenape 798. And the ACP-BA728 & BF728 soap dishes are the only choice for a soap dish with the washcloth holder. AC Products BR794 fully recessed soap dish. BR794 and BR994 specs, pricing, and info. AC Products BR796 fully recessed TP holder. BR796 and BR996 specs, pricing, and info. AC Products BR797 ceramic shower caddy (soap and suds unit). BR797 and BR997 specs, pricing, and info. 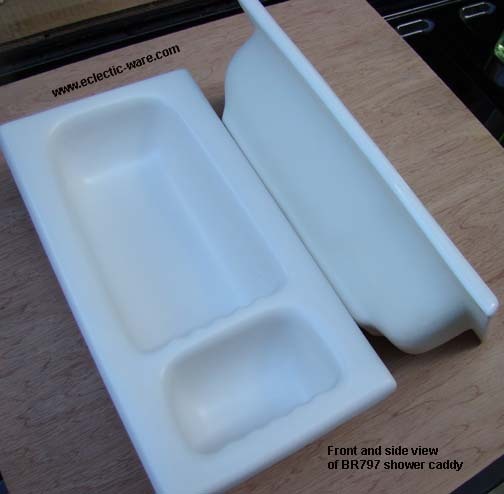 AC Products BM725 mud set mount soap dish. BM725 specs, pricing, and info. 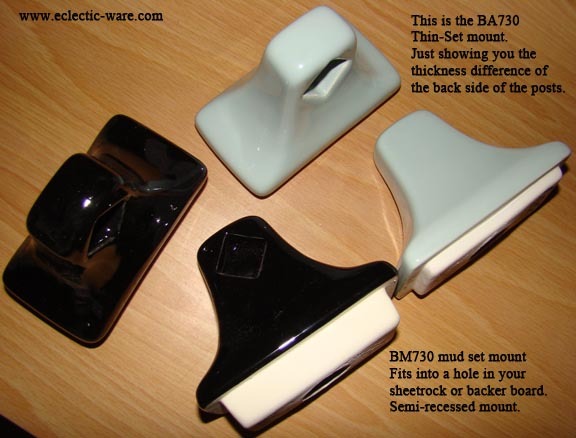 AC Products BM777 mud set TP holder. BM777 specs, pricing, and info. AC Products BM782 tumbler holder or tall soap dish. BM782 specs, pricing, and info. AC Products BM730 mud set towel bar. BM730 specs, pricing, and info. AC Products model 728 soap dish with cradle. BA728 is thin set, BF728 is flat back - BA728 specs, pricing, and info. Please remember, the AC Products bath hardware items shown above are all available in approx. 120 gloss and matte colors. Some are available in the stoneware finish colors. There is minimal information about the AC Products items shown on this page. We have a recessed ceramic bath hardware page in the AC Products section of our web site. On that page will be product dimensions, pricing, colors that we choose to stock, and a lot of other information. Each picture above is also a link to that page. on the AC Products Stylish 700 Series page. This page has been left here to inform you about the Lenape items that have been discontinued. We still get requests about them, and we can offer a few solutions from AC Products. Unfortunately, Lenape has no plans to ever produce their recessed hardware again. Go back. This was the last Lenape page. OR go to AC Products section of our site.